Are The Black And Puerto Rican Exiles in the Country Safe? 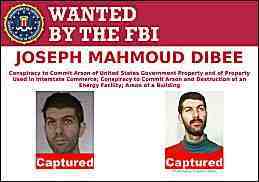 Joseph Mahmoud Dibee, a fugitive animal-rights activist, was intercepted by Cuban authorities in early August and turned over to the FBI. Popped by Cuban cops on an INTERPOL Red Notice, Dibee was flown to Portland, Ore., where he pleaded not guilty to taking part in a 1997 arson attack on a meatpacking plant—the first of several charges he faces. The Cubans were tipped off by US authorities, who learned that Di bee would pass through the island while traveling from Central America to Russia. Dibee was one of 12 accused radical environmentalists of the Earth Liberation Front (ELF) indicted by a grand jury in 2006 for a string of attacks across the West—most famously, the 1998 torching of a Colorado ski resort that was encroaching on endangered lynx habitat. With Dibee’s arrest, only one of the accused remains at large. The case opened much debate about the definition of terrorism, as distinct from sabotage and vandalism—with arson falling into an area where these lines blur. The Dibee affair is perhaps surprising, as Cuba protects several radical fugitives wanted in the United States, refusing to turn them over. The most famous is veteran Black Panther Assata Shakur—the first woman to make the FBI’s “Most Wanted Terrorists” list. Shakur escaped from prison in 1979, and surfaced under her new name in Cuba in 1984. There are others. One is Nehanda Abiodun, who has been in Cuba since 1990, accused by US authorities as an accomplice of Shakur. She has emerged as a mentor figure for a generation of Cuban hip-hop artists. Another is William Morales, accused bomb-maker for the National Liberation Armed Forces, or FALN, a militant organization seeking independence for Puerto Rico. While the FALN’s attack on New York’s Fraunces Tavern in 1975 left four dead, Morales was only convicted on explosives charges. He escaped in 1979, a year after his apprehension, and was Later given asylum in Cuba. Are Shakur and her comrades vulnerable in the wake of Dibee’s surrender? When the Obama administration Launched its rapprochement with Cuba, the surrender of “Joanne Chesimard” was raised as a demand by conservatives in the US, such as then-New Jersey governor Chris Christie. Most observers say that Havana has made clear it will never send her back. Will a post-Castro government eventually be tempted to sacrifice Shakur and the other fugitives in order to get the US sanctions overturned? At the moment, nothing suggests it. Do not write anything about his case.